Israel’s PM Netanyahu fears Kerry’s speech may form basis for more UN action on Israeli-Palestinian conflict. 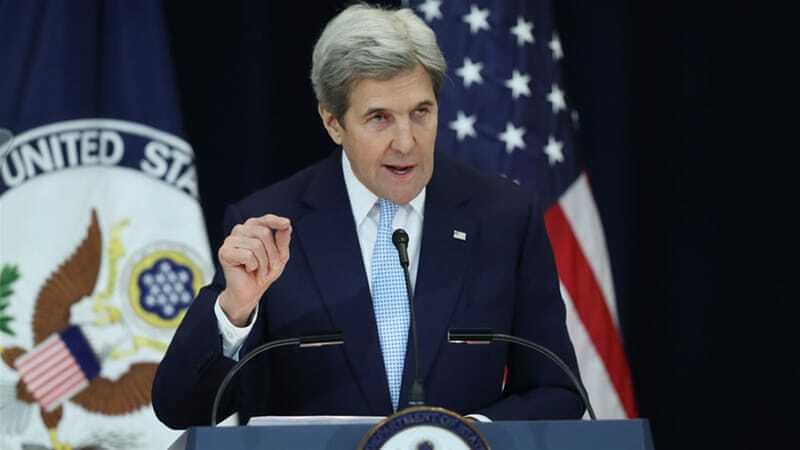 U.S. Secretary of State John Kerry strongly criticized Israel’s government in a speech on Wednesday, saying that trends on the ground are leading to a one-state solution and defending the U.S. decision not to veto a UN Security Council resolution against the Israeli settlements. Netanyahu’s office replied and accused the U.S. Secretary of State of obsessing about settlements. “If the choice is one-state Israel can either be Jewish or democratic, it cannot be both and it will not ever live in peace,” Kerry said. Kerry presented the principles of a future final status agreement: An Israeli and a Palestinian state based on the 1967 lines; full rights to all citizens; a solution to the Palestinian refugee issue; Jerusalem as the capital of both states; an end to the occupation, while satisfying Israel’s security needs, with a demilitarized Palestinian state; an end to all claims by both sides. Thank you all. It’s good to be here even in the middle of a holiday week. I wish you all a happy and productive new year. Today, I want to share candid thoughts about an issue that for decades has animated the foreign policy dialogue here and around the world – the Israeli-Palestinian conflict. Throughout his administration, President Obama has been deeply committed to Israel and its security, and that commitment has guided his pursuit of peace in the Middle East. This is an issue which I’ve worked on intensely during my time as Secretary of State for one simple reason: because the two state solution is the only way to achieve a just and lasting peace between Israelis and Palestinians. It is the only way to ensure Israel’s future as a Jewish and democratic state, living in peace and security with its neighbors. It is the only way to ensure a future of freedom and dignity for the Palestinian people. And it is an important way of advancing U.S. interests in the region. I would like to explain why that future is now in jeopardy, and provide some context for why we could not, in good conscience, stand in the way of a resolution at the United Nations that makes clear that both sides must act now to preserve the possibility of peace. I am also here to share my conviction that there is still a way forward if the responsible parties are willing to act. And I want to share practical suggestions for how to preserve and advance the prospects for the just and lasting peace that both sides deserve. It is vital that we have an honest, clear-eyed conversation about the uncomfortable truths and difficult choices, because the alternative that is fast becoming the reality on the ground is in nobody’s interest – not the Israelis, not the Palestinians, not the region — and not the United States. I want to stress that point: My job, above all, is to defend the United States of America — to stand up for and defend our values and our interests in the world. If we were to stand idly by and know that in doing so we are allowing a dangerous dynamic to take hold which promises greater conflict and instability to a region in which we have vital interests, we would be derelict in our own responsibilities. Regrettably, some seem to believe that the US friendship means the US must accept any policy, regardless of our own interests, our own positions, our own words, our own principles — even after urging again and again that the policy must change. Friends need to tell each other the hard truths, and friendships require mutual respect. Israel’s permanent representative to the United Nations, who does not support a two-state solution, said after the vote last week: “It was to be expected that Israel’s greatest ally would act in accordance with the values that we share” and veto this resolution. I am compelled to respond that the United States, did in fact vote “in accordance with our values,” just as previous U.S. administrations have done at the Security Council. They fail to recognize that this friend, the United States, that has done more to support Israel than any other country, this friend that has blocked countless efforts to delegitimize Israel, cannot be true to our own values — or even the stated democratic values of Israel — and we cannot properly defend and protect Israel — if we allow a viable two state solution to be destroyed before our eyes. And that’s the bottom line: the vote in the UN was about preserving the two state solution. That’s what we were standing up for: Israel’s future as a Jewish and democratic state, living side by side in peace and security with its neighbors. That’s what we are trying to preserve, for our sake and for theirs. In fact, this administration has been Israel’s greatest friend and supporter, with an absolutely unwavering commitment to advancing Israel’s security and protecting its legitimacy. On this point, I want to be very clear. No American Administration has done more for Israel’s security than Barack Obama’s. The Israeli Prime Minister himself has noted our unprecedented military and intelligence co-operation. Our military exercises are more advanced than ever. Our assistance for Iron Dome has saved countless Israeli lives. We have consistently supported Israel’s right to defend itself, by itself, including during actions in Gaza that sparked great controversy. Time and again we have demonstrated that we have Israel’s back. We have strongly opposed boycotts, divestment campaigns and sanctions targeting Israel in international forums, whenever and wherever its legitimacy was attacked, and we have fought for its inclusion across the UN system. In the midst of our own financial crisis and budget deficits, we repeatedly increased funding to support Israel. In fact, more than half of our entire global Foreign Military Financing goes to Israel. And this fall, we concluded an historic 38 billion dollar Memorandum of Understanding that exceeds any military assistance package the U.S. has provided to any country, at any time, and that will invest in cutting edge missile defense, and sustain Israel’s Qualitative Military Edge for years to come. This commitment to Israel’s security is very personal for me. On my first trip to Israel as a young senator in 1986, I was captivated by a special country I immediately admired and soon grew to love. Over the years, like so many others who are drawn to this extraordinary place, I have climbed Masada, swum in the Dead Sea, driven from one Biblical city to another. I have also seen the dark side of Hezbollah’s rocket storage facilities just across the border in Lebanon, walked through exhibits on the hell of the Holocaust at Yad Vashem, stood on the Golan Heights, and piloted an Israeli jet over the tiny airspace of Israel, which would make anyone understand the importance of security to Israelis. Out of those experiences came a steadfast commitment to Israel’s security that has never wavered for a single minute in my 28 years in the Senate or my 4 years as Secretary. I have also often visited West Bank communities, where I met Palestinians struggling for basic freedom and dignity amidst the occupation, passed by the military checkpoints that can make even the most routine daily trips to work or school an ordeal, and heard from business leaders who could not get the permits needed to get their products to the market and families who have struggled to secure permission to travel for needed medical care. And I have witnessed first-hand the ravages of a conflict that has gone on for far too long. I’ve seen Israeli children in Sderot whose playgrounds had been hit by Katyusha rockets, and visited shelters next to schools in Kiryat Shmona that kids had 15 seconds to get to after a warning siren went off. I’ve also seen the devastation of war in the Gaza Strip, where Palestinian girls in Izbet Abed Rabo played in the rubble of a bombed-out building. No children – Israeli or Palestinian — should have to live like that. So, despite the obvious difficulties, I knew when I became Secretary of State I would do everything in my power to help end the conflict. And I was grateful to be working for President Obama, who was prepared to take risks for peace and was deeply committed to that effort. Like previous U.S. administrations, we have committed our influence and resources to trying to resolve the Arab-Israeli conflict because it would serve American interests to stabilize a volatile region and fulfil America’s commitment to the survival, security and well-being of Israel at peace with its Arab neighbors. Despite our best efforts over the years, the two state solution is now in serious jeopardy. The truth is that trends on the ground –violence, terrorism, incitement, settlement expansion and the seemingly endless occupation – are destroying hopes for peace on both sides and increasingly cementing an irreversible one-state reality that most people do not actually want. Today, there are a similar number of Jews and Palestinians living between the Jordan River and the Mediterranean Sea. They have a choice. They can choose to live together in one state, or they can separate into two states. But here is a fundamental reality: if the choice is one state, Israel can either be Jewish or democratic – it cannot be both –and it won’t ever really be at peace. Moreover, the Palestinians will never fully realize their vast potential in a homeland of their own with a one state solution. Most on both sides understand this basic choice, and that’s why it’s important that polls of Israelis and Palestinians show there is still strong support for the two state solution – in theory. They just don’t believe that it can happen. After decades of conflict, many no longer see the other side as people, only as threats and enemies. Both sides continue to push a narrative that plays to people’s fears and reinforces the worst stereotypes – rather than working to change perceptions and build up belief in the possibility of peace. And the truth is, the extraordinary polarization in this conflict extends beyond Israelis and Palestinians. Allies of both sides are content to reinforce this “with us or against us mentality” where too often anyone who questions Palestinian actions is an apologist for the occupation and anyone who disagrees with Israeli policy is cast as anti-Israel or even antisemitic. That’s one of the most striking realties about the current situation: This critical decision about the future – one state or two states — is effectively being made on the ground every day, despite the expressed opinion of the majority of the people. The status quo is leading towards one state and perpetual occupation, but most of the public either ignores it or has given up hope that anything can be done to change it. With this passive resignation, the problem only gets worse, the risks get greater and the choices are narrowed. This sense of hopelessness among Israelis is exacerbated by the continuing violence, terrorist attacks against civilians and incitement – which are destroying belief in the possibility of peace. Let me say it again: There is absolutely no justification for terrorism, and there never will be. The most recent wave of Palestinian violence has included hundreds of terrorist attacks in the past year, including stabbings, shootings, vehicular attacks and bombings, many by individuals who have been radicalized by social media. Yet the murderers of innocents are still glorified on Fatah web sites, including showing attackers next to Palestinian leaders following attacks. And despite statements by President Abbas and his party’s leaders making clear their opposition to violence, too often they send a different message by failing to condemn specific terrorist attacks and naming public squares, streets and schools after terrorists. President Obama and I have made clear to the Palestinian leadership countless times, publicly and privately, that all incitement to violence must stop. We have consistently condemned violence and terrorism – and even condemned the Palestinian leadership for not condemning it. Far too often, the Palestinians have pursued efforts to delegitimize Israel in international forums. We have strongly opposed these initiatives, including the recent wholly unbalanced and inflammatory UNESCO resolution regarding Jerusalem. And we have made clear our strong opposition to Palestinian efforts against Israel at the ICC, which only set back the prospects for peace. And we all understand that the Palestinian Authority also has more to do to strengthen institutions and improve governance. Most troubling of all, Hamas continues to pursue an extremist agenda: they refuse to accept Israel’s very right to exist. They have a one state vision of their own: all of the land is Palestine. Hamas and other radical factions are responsible for most explicit forms of incitement to violence, and many of the images they use are truly appalling. And they are willing to kill innocents in Israel and put the people of Gaza at risk in order to advance that agenda. Compounding this, the humanitarian situation in Gaza, exacerbated by the closures of the crossings, is dire. Gaza is home to one of the world’s densest concentrations of people enduring extreme hardships with few opportunities.1.3 million people out of Gaza’s population of 1.8 million are in need of daily assistance, including food and shelter, most have electricity less than half the time, and only 5 percent of the water is safe to drink. And yet despite the urgency of these needs, Hamas and other militant groups continue to re-arm and divert reconstruction materials to build tunnels, threatening more attacks on Israeli civilians that no government can tolerate. At the same time, we must be clear about what is happening in the West Bank. The Israeli Prime Minister publicly supports a two state solution, but his current coalition is the most right wing in Israeli history, with an agenda driven by its most extreme elements. The result is that policies of this government – which the Prime Minister himself just described as “more committed to settlements than any in Israel’s history” – are leading in the opposite direction, towards one state. In fact, Israel has increasingly consolidated control over much of the West Bank for its own purposes – effectively reversing the transition to greater Palestinian civil authority called for by the Oslo accords. I don’t think most people in Israel – and certainly in the world – have any idea how broad and systematic this process has become. The facts speak for themselves. The number of settlers in the roughly 130 Israeli settlements east of the 1967 lines has steadily grown. The settler population in the West Bank alone – not including East Jerusalem – has increased by nearly 270,000 since Oslo, including 100,000 just since 2009 when President Obama’s term began. And there is no point pretending they’re just in large settlement blocs: nearly 90,000 settlers are living east of the separation barrier that was created by Israel itself, in the middle of what by any reasonable definition would be the future Palestinian state. And the population of these distant settlements has grown by 20,000 just since 2009. In fact, just recently the government approved a significant new settlement well east of the barrier – closer to Jordan than Israel. What does that say to Palestinians in particular – but also to the U.S and the world –about Israel’s intentions? Let me emphasize: this is not to say that the settlements are the whole or even primary cause of the conflict – of course they are not. Nor can you say that if they were removed you would have peace without a broader agreement – you would not. And we understand that in a final status agreement, certain settlements would become part of Israel to account for the changes that have taken place over the last 49 years, including the new demographic realities on the ground. But if more and more settlers are moving into the middle of the Palestinian areas, it’s going to be that much harder to separate, that much harder to imagine transferring sovereignty – and that is exactly the outcome that some are accelerating. Let’s be clear: settlement expansion has nothing to do with Israel’s security; many settlements actually increase the security burden on the IDF. And leaders of the settler movement are motivated by ideological imperatives that entirely ignore legitimate Palestinian aspirations. Among the most troubling illustrations of this point has been the proliferation of settler outposts that are illegal under Israel’s own laws. They are often located on private Palestinian land and strategically placed to make two states impossible. There are over 100 of these outposts, and since 2011, nearly one third have been – or are being – legalized, despite pledges by past Israeli governments to dismantle many of them. Now, leaders of the settler movement have advanced unprecedented new legislation that would legalize most of the outposts. For the first time, it would apply Israeli domestic law to the West Bank – rather than military law – a major step towards annexation. Even the Israeli Attorney General has said the draft law is unconstitutional and a violation of international law. Now you may hear that the settlements are not an obstacle to peace because the settlers who don’t want to leave can just stay in Palestine, like the Arab Israelis who live in Israel. But that misses a critical point: the Arab Israelis are citizens of Israel, subject to Israel’s laws. Does anyone really believe the settlers will agree to submit to Palestinian law in Palestine? Likewise, some supporters of the settlements argue that the settlers could just stay in their settlements, and remain as Israeli citizens in their separate enclaves in the middle of Palestine, protected by the IDF. There are over 80 settlements east of the separation barrier, many located in places that would make a contiguous Palestinian state impossible. Does anyone seriously think that if they just stay where they are you could still have a viable Palestinian state? Some have asked, “Why can’t we build in the blocs which everyone knows will eventually be part of Israel?” The reason building there or anywhere else in the West Bank now results in such pushback is that the decision of what constitutes a bloc is being made unilaterally by the Israeli government, without consultation, without the consent of the Palestinians – and without granting the Palestinians a reciprocal right to build in what will by most accounts be part of Palestine. Bottom line – without agreement or mutuality, the unilateral choices become a major point of contention. You may hear that these remote settlements aren’t a problem because they only take up a small percentage of the land. Again and again we have made clear that it’s not just a question of the overall amount of land available in the West Bank– it’s whether the land can be connected or is broken up into small parcels that could never constitute a real state. The more outposts that are built, the more settlements expand, the less possible it is to create a contiguous state. So in the end, a settlement is not just the land it’s on, it’s also what the location does to the movement of people, what it does to the ability of a road to connect, what it does to the sense of statehood that is chipped away with each new construction. No one thinking seriously about peace can ignore the reality of the threat settlements pose to peace. But the problem goes well beyond just settlements: trends indicate a comprehensive effort to take West Bank land for Israel and prevent any Palestinian development there. Today, the 60% of the West Bank known as Area C – much of which was supposed to be transferred to Palestinian control long ago under the Oslo accords – is effectively off limits to Palestinian development. Most has essentially been taken for exclusive Israeli use by unilaterally designating it as “state land” or including it within the jurisdiction of regional settlement councils. Israeli farms flourish in the Jordan River Valley and Israeli resorts line the shores of the Dead Sea – where Palestinian development is not allowed. In fact, almost no private Palestinian building is approved in Area C at all – only one permit was issued by Israel in all of 2014 and 2015, while approvals for hundreds of settlement units were advanced during that same period. Moreover, Palestinian structures in Area C that do not have a permit from the Israeli military are potentially subject to demolition. And they are currently being demolished at historically high rates: over 1,300 Palestinians, including over 600 children, have been displaced in 2016 alone — more than any previous year. So the settler agenda is defining the future in Israel. And their stated purpose is clear: They believe in one state: greater Israel. In fact, one prominent minister who heads a pro-settler party declared just after the U.S. election that “the era of the two state solution is over,” and many other coalition ministers publicly reject a Palestinian state. And they are increasingly getting their way, with plans for hundreds of new units in East Jerusalem recently announced and talk of a major new settlement building effort in the West Bank to follow. So why are we so concerned? Well ask yourself these questions: What happens if they succeed? Where does that lead? There are currently about 2.75 million Palestinians living under military occupation in the West Bank, most of them in Areas A and B where they have limited autonomy. They are restricted in their daily movements by a web of checkpoints, and unable to travel into or out of the West Bank without a permit from the Israelis. So if there is only one state, you would have millions of Palestinians permanently living in segregated enclaves in the middle of the West Bank, with no real political rights, separate legal, education and transportation systems, vast income disparities, under a permanent military occupation that deprives of them of the most basic freedoms – separate but unequal. Nobody can explain how that works. Would an Israeli accept living that way? Would an American? Will the world accept it? If the occupation becomes permanent, over time the Palestinian Authority could dissolve and turn over all administrative and security responsibilities to the Israelis. What would happen then? Who would administer the schools and hospitals? Does Israel want to pay for the billions of dollars of lost international assistance that the PA now receives? Would the Israel Defense Force police the streets in every Palestinian city and town? How would Israel respond to a growing civil rights movement from Palestinians demanding a right to vote, or widespread protests and unrest across the West Bank? How does Israel reconcile a permanent occupation with its democratic ideals? How does the U.S. continue to defend that and still live up to our own democratic ideals? Nobody has ever provided good answers to those questions because there aren’t any. And there would be an increasing risk of more intense violence between Palestinians and settlers, and complete despair among Palestinians would create fertile ground for extremists. With all the external threats Israel faces, does it really want an intensifying conflict in the West Bank? How does that help Israel’s security? The answer: It doesn’t. Which is precisely why so many senior Israeli military and intelligence leaders – past and present – believe the two-state solution is the only real answer for Israel’s long term security. One thing we do know: if Israel goes down the one state path, it will never have true peace with the rest of the Arab world, and I can say that with certainty. The Arab countries have made clear that they will not make peace with Israel without resolving the Israeli-Palestinian conflict — that’s not where their loyalties or their politics are. But there is something new here. Common interests in countering Iran’s destabilizing activities and fighting extremists as well as diversifying their economies have created real possibilities. I have spent a great deal of time with key Arab leaders exploring this, and there is no doubt that they are prepared to have a fundamentally different relationship with Israel. That was stated in the Arab Peace Initiative, and all my recent conversations have confirmed their readiness, in the context of Israeli-Palestinian peace, not just to normalize relations — but to work openly on securing that peace with significant regional security cooperation. Many have shown a willingness to support serious Israeli-Palestinian negotiations and to take steps on the path to normalization of relations – including public meetings — providing there is meaningful progress towards a two state solution. That is a real opportunity that should not be missed. That raises one final question: is ours the generation that gives up on the dream of a Jewish, democratic state of Israel living in peace and security with its neighbors? Because that is literally what is at stake. That is what informed our vote at the Security Council last week: the need to preserve the two state solution. And both sides must take responsibility for that. We have repeatedly and emphatically stressed to the Palestinians that all incitement to violence must stop. We have consistently condemned all violence and terrorism. And we have strongly opposed unilateral efforts to delegitimize Israel in international forums. We have made countless public and private exhortations to the Israelis to stop the march of settlements. In literally hundreds of conversations with Prime Minister Netanyahu, I have made clear that continued settlement activity would only increase pressure for an international response. We have all known for some time that the Palestinians were intent on moving forward with a settlements resolution, and I advised the Prime Minister repeatedly that further settlement activity only invited UN action. Yet the settlement activity only increased – including advancing the unprecedented legislation to legalize settler outposts that the Prime Minister himself reportedly warned could expose Israel to action at the Security Council and even international prosecution, before deciding to support it. In the end, we could not in good conscience protect the most extreme elements of the settler movement as it tries to destroy the two state solution. We could not in good conscience turn a blind eye to Palestinian actions that fan hatred and violence. It is not in U.S. interests to help anyone on either side create a unitary state. We may not be able to stop them, but we cannot be expected to defend them. And it is certainly not the role of any country to vote against its own policies. That is why we decided not to block the UN resolution that makes clear both sides have to take steps to save the two state solution while there is still time. We did not take this decision lightly. The Obama administration has always defended Israel against any efforts at the UN and any international forums, or biased and one-sided resolutions that seek to undermine its legitimacy or security. And that has not changed. But it’s important to remember that every U.S. administration – Republican and Democratic – has opposed settlements as contrary to the prospects for peace. And action at the UN Security Council is far from unprecedented: In fact, previous U.S. Administrations of both political parties have allowed resolutions that were critical of Israel to pass, including on settlements, on dozens of occasions. – which the resolution defined as including Jerusalem. All of the 14 other Security Council members voted in favor. That story was not written last week; it was written December 23, 1987 — 26 years to the day [on which] we voted last week, when Ronald Reagan was president. Yet despite growing pressure, the Obama administration held a strong line against any UN action – we were the only administration since 1967 that had not allowed any resolution to pass that Israel opposed. In fact, the only time in 8 years the Obama administration exercised its veto at the United Nations was against a one-sided settlements resolution in 2011 that did not mention incitement or violence. Let’s look at what’s happened since then: There have been over 30,000 settlement units advanced through some stage of the planning process. That’s right: over thirty thousand settlement units. And if we had vetoed this resolution, the United States would have been giving license to further unfettered settlement construction that we fundamentally oppose. We reject the criticism that this vote abandons Israel. On the contrary, it is not this Resolution that is isolating Israel. It is a policy of permanent settlement construction that risks making peace impossible. Virtually every country in the world other than Israel opposes settlements. That includes many friends of Israel — including the United Kingdom, France and Russia – all of whom voted in favor of the settlements resolution in 2011 and again this year, along with every other member of the Council. In fact, this resolution simply reaffirms statements made by the Security Council on the legality of settlements over several decades; it does not break new ground. In 1978, the State Department legal advisor advised the Congress of his conclusion that the Israeli government’s program of establishing civilian settlements in the occupied territory is inconsistent with international law. We see no change since then to affect that fundamental conclusion. You may have heard some criticize this resolution for calling East Jerusalem occupied territory. But to be clear, there was absolutely nothing new in last week’s resolution on that issue. It was one of a long line of Security Council resolutions that included East Jerusalem as part of the territories occupied by Israel in 1967, and that includes resolutions passed by the Security Council under President Reagan and President George H.W. Bush. And remember that every U.S. administration since 1967 – along with the entire international community – has recognized East Jerusalem as among the territories that Israel occupied in the Six Day War. And I want to stress this point: we fully respect Israel’s profound historic and religious ties to the city and its holy sites. This resolution in no manner prejudges the outcome of permanent status negotiations on East Jerusalem, which must of course reflect those ties and realities on the ground. We also strongly reject the notion that somehow the United States was the driving force behind this resolution. The Egyptians and Palestinians had long made clear their intention to bring a resolution to a vote before the end of the year. The United States did not draft or originate this resolution, nor did we put it forward. It was drafted and ultimately introduced by Egypt, which is one of Israel’s closest friends in the region, in coordination with the Palestinians and others. During the course of this process, we made clear to others, including those on the Security Council, that we would oppose any resolution that did not include language on terrorism and incitement. Making such positions clear is standard practice with resolutions at the Security Council. The Egyptians, Palestinians and many others understood that if the text were more balanced, it was possible we would not block it. But we also made crystal clear that the President would not make a final decision about our own position until we saw the final text. In the end, we did not agree with every word in this resolution. There are important issues that are not sufficiently addressed – or addressed at all. But we could not in good conscience veto a resolution that condemns violence and incitement, reiterates what has long been the overwhelming consensus international view on settlements, and calls for the parties to start taking constructive steps to advance the two state solution on the ground. Ultimately, it will be up to the Israeli people to decide whether the unusually heated attacks that Israeli officials have directed toward this administration best serve Israel’s national interests and its relationship with an ally that has been steadfast in its support. Those attacks, alongside allegations of a U.S.-led conspiracy and other manufactured claims, distract and divert attention from what the substance of this vote really was about. We all understand that Israel faces very serious threats in a very tough neighborhood. Israelis are rightfully concerned about making sure that there is not a new terrorist haven next door. And Israelis are fully justified in decrying attempts to delegitimize their state and question the right of a Jewish state to exist. But this vote was not about that. It was about actions that Israelis and Palestinians are taking that are increasingly rendering a two-state solution impossible. It was not about making peace with the Palestinians now — it was about making sure peace with the Palestinians will be possible in the future. Now we all understand that Israel faces very serious threats in a very tough neighborhood. And Israelis are rightfully concerned about making sure that there is not a new terrorist haven next door. But this vote is not about making peace with the Palestinians now — it is about making sure peace with the Palestinians is possible in the future. So how do we get there? Since the parties have not yet been able to resume talks, the U.S. and the Middle East Quartet have repeatedly called on both sides to independently demonstrate a genuine commitment to the two state solution – not just with words, but with real actions and policies – to create the conditions for meaningful negotiations. We have called for both sides need to take significant steps on the ground to reverse current trends and send a clear message that they are prepared to fundamentally change the equation – without waiting for the other side to act. We have pushed them to comply with their basic commitments under their own prior agreements in order to advance a two state reality on the ground. We have called for the Palestinians to do everything in their power to stop violence and incitement, including publicly and consistently condemning acts of terrorism and stopping the glorification of violence. We have called on them to continue efforts to strengthen institutions and improve governance. And we have stressed that the Hamas arms build-up and militant activities in Gaza must stop. Along with our Quartet partners, we have called on Israel to end the policy of settlement construction and expansion, taking of land for exclusive Israeli use, and denying Palestinian development. To reverse this process, the US and our partners have encouraged Israel to resume the transfer of civil authority to the Palestinians in Area C, consistent with the transition called for by Oslo. We have made clear that significant progress across a range of sectors – including housing, agriculture, and natural resources – can be made without negatively impacting Israel’s legitimate security needs. And we’ve called for significantly easing the movement and access restrictions to and from Gaza, with due consideration for Israel’s need to protect its citizens from terrorist attacks. Let me stress here again: none of these steps would negatively impact Israel’s security. Let me also emphasize – this is not about offering limited economic measures that perpetuate the status quo. We are talking about significant steps that would signal real progress towards creating two states. That’s the bottom line: If we are serious about the two state solution, it is time to start implementing it now. Advancing the process of separation now, in a serious way, could make a significant difference in saving the two state solution. And much progress can be made in advance of negotiations, as contemplated by the Oslo process – in fact, these steps will help create the conditions for successful talks. In the end, we all understand that a final status agreement can only be achieved through direct negotiations between the parties, because peace cannot be imposed. There are other countries in the UN who believe it is our job to dictate the terms of a solution in the Security Council. Others want us to simply recognize a Palestinian state absent an agreement. These are not the choices we will make. We choose instead, drawing on the experiences of the past eight years, to provide a way forward when the parties are ready for serious negotiations. In a place where the narratives from the past powerfully inform the present, it’s important to understand the history. We mark this year and next a series of milestones that I believe both illustrate the two sides of the conflict and form the basis for its resolution. It’s worth touching on them briefly. 120 years ago, the First Zionist Congress was convened in Basel by a group of Jewish visionaries who decided that the only effective response to the waves of antisemitic horrors sweeping across Europe was to create a state in the historic home of the Jewish people, where their ties to the land went back centuries – a state that could defend its borders, protect its people, and live in peace with its neighbors. That was the modern beginning and it remains the dream of Israel today. Nearly seventy years ago, United Nations General Assembly Resolution 181 finally paved the way to making the State of Israel a reality. The concept was simple: create two states for two peoples, one Jewish and one Arab, to realize the national aspirations of both Jews and Palestinians. Both Israel and the PLO referenced Resolution 181 in their respective Declarations of Independence. The United States recognized Israel seven minutes after its creation – but the Palestinians and the Arab world did not, and from its birth Israel had to fight for its life. Palestinians also suffered terribly in that 1948 war, including many who had lived for generations in a land that had long been their home too. When Israel celebrates its 70th anniversary in 2018, the Palestinians will mark a very different anniversary: 70 years since what they call the “Nakba,” or catastrophe. Next year will also mark 50 years since the end of the Six-Day War, when Israel again fought for its survival. And Palestinians will again mark just the opposite: 50 years of military occupation. Both sides have accepted UN Security Council Resolution 242, which called for the withdrawal of Israel from territory it occupied in 1967 in return for peace and secure borders, as the basis for ending the conflict. It has been more than twenty years since Israel and the PLO signed their first agreement – the Oslo Accords – and the PLO formally recognized Israel. Both sides committed to a plan to transition much of the West Bank and Gaza to Palestinian control during permanent status negotiations that would put an end to their conflict. Unfortunately, neither the transition nor the final agreement came about – and both sides bear responsibility for that. Finally, some 15 years ago King Abdullah of Saudi Arabia came out with the historic Arab Peace Initiative, which offered fully normalized relations with Israel when it made peace – an enormous opportunity then and now, which has never fully been embraced. That history was critical to our approach to trying to resolve the conflict. And based on my experience with both sides over the last four years, including the nine months of formal negotiations, the core issues can be resolved if there is leadership on both sides committed to finding a solution. In the end, I believe the negotiations did not fail because the gaps were too wide – but because the level of trust was too low. Both sides were concerned that any concessions would not be reciprocated — and would come at too great a political cost. And the deep public scepticism only made it more difficult to take risks. In the countless hours we spent working on a detailed framework, we worked through numerous formulations and developed specific bridging proposals. And we came away with a clear understanding of the fundamental needs of both sides. In the past two and a half years, I have tested ideas with key regional and international stakeholders, including our Quartet partners. I believe what has emerged is a broad consensus on balanced principles that would satisfy the core needs of both sides. President Clinton deserves great credit for laying out extensive parameters designed to bridge gaps in advanced final status negotiations sixteen years ago. Today, with mistrust too high to even start talks, we are at the opposite end of the spectrum. Neither side is willing to even risk acknowledging the other’s bottom line, and more negotiations that do not produce progress will only reinforce the worst fears. Everyone understands that negotiations would be complex and difficult, and nobody can be expected to agree on the final result in advance. But if the parties could at least demonstrate that they understand the other side’s most basic needs — and are potentially willing to meet them if theirs are also met at the end of comprehensive negotiations — enough trust could be established to enable a meaningful process to begin. 1. Provide for secure and recognized international borders between Israel and a viable and contiguous Palestine, negotiated based on the 1967 lines with mutually agreed equivalent swaps. Resolution 242, which has been enshrined in international law for 50 years, provides for the withdrawal of Israel from territory it occupied in 1967 in return for peace with its neighbors and secure and recognized borders. It has long been accepted by both sides, and it remains the basis for an agreement today. As Secretary [of State], one of the first issues I worked out with the Arab League was their agreement that the reference in the Arab Peace Initiative to the 1967 lines included the concept of land swaps, which the Palestinians have acknowledged. This is necessary to reflect practical realities on the ground, and mutually agreed equivalent swaps will ensure the agreement is fair to both sides. There is also broad recognition of Israel’s need to ensure that the borders are secure and defensible, and that the territory of Palestine is viable and contiguous. Virtually everyone I have spoken to has been clear on this principle as well: No changes by Israel to the 1967 lines will be recognized by the international community unless agreed to by both sides. 2. Fulfil the vision of UN General Assembly Resolution 181 of two states for two peoples, one Jewish and one Arab, with mutual recognition and full equal rights for all their respective citizens. This has been the foundational principle of the two state solution from the beginning: Creating a state for the Jewish people and a state for the Palestinian people, where each can achieve their national aspirations. And resolution 181 is incorporated into the foundational documents of both the Israelis and Palestinians. Recognition of Israel as a Jewish state has been the U.S. position for years, and based on my conversations, I am convinced many others are now are prepared to accept it as well – provided the need for a Palestinian state is also addressed. We also know there are some 1.7 million Arab citizens who call Israel their home and must now and always be able to live as equal citizens, which makes this a difficult issue for Palestinians and others in the Arab world. That is why it is so important that in recognizing each other’s homeland – Israel for the Jewish people and Palestine for the Palestinian people – both sides reaffirm their commitment to upholding full equal rights for all of their respective citizens. 3. Provide for a just, agreed, fair and realistic solution to the Palestinian refugee issue, with international assistance, that includes compensation, options and assistance in finding permanent homes, acknowledgment of suffering and other measures necessary for a comprehensive resolution consistent with two states for two peoples. The plight of many Palestinian refugees is heartbreaking, and all agree their needs must be addressed. As part of a comprehensive resolution, they must be provided with compensation, their suffering must be acknowledged, and there will need to be options and assistance in finding permanent homes. The international community can provide significant support and assistance, including in raising money to help ensure the compensation and other needs of the refugees are met, and many have expressed a willingness to contribute. But there is general recognition that the solution must be consistent with two states for two peoples, and cannot affect the fundamental character of Israel. 4. Provide an agreed resolution for Jerusalem as the internationally recognized capital of the two states, and protect and assure freedom of access to the holy sites consistent with the established status quo. Jerusalem is the most sensitive issue for both sides, and the solution must meet the needs not only of the parties, but of all three monotheistic faiths. That is why the holy sites that are sacred to billions of people around the world must be protected and remain accessible, and the established status quo maintained. Most acknowledge that Jerusalem should not be divided again like it was in 1967. At the same time, there is broad recognition that there will be no peace agreement without reconciling the basic aspirations of both sides to have capitals there. 5. Satisfy Israel’s security needs and bring a full end to the occupation, while ensuring that Israel can defend itself effectively and that Palestine can provide security for its people in a sovereign and non-militarized state. Security is the fundamental issue for Israel. Everyone understands that no Israeli government can ever accept an agreement that does not satisfy its security needs or risks creating an enduring security threat like Gaza in the West Bank. And Israel must be able to defend itself effectively, including against terrorism and other regional threats. In fact, there is a real willingness by Egypt, Jordan and others to work together with Israel on meeting key security challenges. I believe these collective efforts, including close coordination on border security, intelligence sharing, and joint operations, can play a critical role in securing the peace. At the same time, fully ending the occupation is the fundamental issue for the Palestinians: They need to know that the military occupation will really end after an agreed transitional process, and that they can live in freedom and dignity in a sovereign state while providing security for their population even without a military of their own. This is widely accepted as well. Balancing those requirements was among the most important challenge we faced in the negotiations, but one where the United States could provide the most assistance. That’s why a team led by General John Allen, one of our nation’s foremost military minds, and dozens of experts from the Department of Defense and other agencies, engaged extensively with the IDF on trying to find solutions that could help Israel address its legitimate security needs. They developed innovative approaches to creating unprecedented, multi-layered border security, enhancing Palestinian capacity, and enabling Israel to retain the ability to address threats by itself even when the occupation had ended. General Allen and his team were not suggesting any particular outcome or timeline– they were simply working on ways to support whatever the negotiators agreed to. And they did some very impressive work that gives me confidence that Israel’s security requirements can be met. 6. End the conflict and all outstanding claims, enabling normalized relations and enhanced regional security for all as envisaged by the Arab Peace Initiative. It is essential for both sides that the final status agreement resolves all the outstanding issues and finally brings closure to the conflict, so they can move ahead to a new era of peaceful coexistence and cooperation. For Israel, this must also bring broader peace with its Arab neighbors. That is the fundamental promise of the Arab Peace Initiative, which key Arab leaders have affirmed. The API also envisions enhanced security for all in the region. This is the area where Israel and the Arab world are looking at the greatest moment of potential transformation in the Middle East since Israel’s creation in 1948. The Arab world faces its own set of security challenges. With Israeli-Palestinian peace, Israel, the United States, Jordan and Egypt — together with the GCC countries — would be ready and willing to define a new security partnership for the region that would be groundbreaking. Ladies and Gentlemen: it’s vital that we all work to keep open the possibility of peace, and that we not lose hope in the two state solution, no matter how difficult it may seem — because there really is no viable alternative. We all know that a speech alone won’t produce peace. But based on over 30 years of experience and the lessons from the past four years, I have suggested a practical path that the parties could take. Realistic steps on the ground now, consistent with the parties’ own prior commitments, that will begin the process of separating into two states, a political horizon to work towards to create the conditions for successful final status talks, and a basis for negotiations that the parties could accept to demonstrate that they are serious about making peace. We can only encourage them to take this path, we cannot walk down it for them. But if they ever take those steps, peace would bring extraordinary benefits in enhancing the security, stability and prosperity of Israelis, Palestinians and the entire region. The Palestinian economy has amazing potential in the context of independence, with major private sector investment possibilities and a talented young workforce. And Israel’s economy could enjoy unprecedented growth as it becomes a regional economic powerhouse, taking advantage of its unparalleled culture of innovation and trading opportunities with new Arab partners. Meanwhile, security challenges could be addressed by an entirely new security arrangement, in which Israel co-operates openly with key Arab states. That is the future that everyone should be working for. President Obama and I know that the incoming Administration has signaled that they will take a different path, and even suggested breaking from long-standing U.S. policies on settlements, Jerusalem — and possibly the two state solution. That is for them to decide. But we cannot – in good conscience –do nothing, and say nothing, when we see the hope of peace slipping away. This is a time to stand up for what is right. We have long known what two-states, living side by side, in peace and security looks like. We should not be afraid to say so. I really began to reflect on what we have learned — and the way ahead — when I recently joined President Obama in Jerusalem for the state funeral for Shimon Peres. Shimon was one of the founding fathers of Israel who became one of the world’s great elder-statesmen. I was proud to call him my friend, and I know President Obama was as well. I remembered the first time I saw Shimon in person — standing on the White House lawn for the signing the historic Oslo Accords. And I thought about the last time, at an intimate Shabbat dinner just a few months before he died when we toasted to the future of Israel and to the peace he still so passionately believed in for his people. He summed it up simply and eloquently, as only Shimon could: “The original mandate gave the Palestinians 48%, now it’s down to 22%. I think 78% is enough for us.” As we laid Shimon to rest that day, many of us couldn’t help but wonder if peace between Israelis and Palestinians was also being buried along with one of its most eloquent champions. We cannot let that happen, that there was simply too much at stake – for future generations of Israelis and Palestinians — to give in to pessimism, especially when peace is in fact still possible. We must not lose hope in the possibility of peace. We must not give in to those who say what is now must always be, that there is no chance for a better future. Ultimately, it is up to Israelis and Palestinians to make the difficult choices for peace – and if they are, we can all help. And for the sake of future generations of Israelis and Palestinians, for all the people of the region, and for the United States, let’s hope they are prepared to make those choices now.